The Scotsman who made the "P. & O." Head of the "P. & O.," the most famous shipping concern in the world, with a fleet which has cost upwards of eight millions sterling; including a reserve fund of a solid million—surely a proud position to be reached by a Scottish lad who began life as a junior clerk, at the age of fifteen, with no special prospects of a successful career. His assets consisted of a clear brain, a sound Grammar School education, and that pluck, perseverance and determination to succeed which seems to be inherent in all youthful Scotsmen! This is the story in a nutshell of Sir Thomas Sutherland, G.C.M.G.. LL.D., ex-M.P. for the Greenock Division, founder of the Hong Kong and Shanghai Banking Corporation, the premier financial establishment of the East, and earthly providence for the past thirty years of the far-famed Peninsular and Oriental Steam Navigation Company. Sir Thomas Sutherland is descended from a family which has for many years been settled in Edinburgh, although he was born much further north. His father, who had been brought up to no trade or profession, while yet a youth inherited a modest patrimony of some few hundreds of pounds, with which he promptly set out for the Cape, in search of adventure and wealth. In regard to the latter he was thoroughly unsuccessful, and he drifted homewards and found his way, to Aberdeen, where he married pretty Christian Webster, set up in business, and soon afterwards died. It was here, in the city of granite and the salt sea wind, in 1834, that the future Chairman of the " P. & O." was born. His parents, as may be inferred, were not blessed with a superabundance of wealth, and on the death of his father, the youngster was taken to the house of his grandfather Webster, his mother’s father, who brought him up. The boy was blessed in the possession of such guardians as his maternal grandparents. Grandfather Webster had made a sufficient fortune as the owner of a cooperage and fish-curing establishment on the east coast of Scotland, not far from Aberdeen, and had then retired from business. Thomas Webster and his wife were a stern, serious, strong-minded old couple, who took a very grave view of their responsibilities towards their little grandson, and so he passed through a very sedate child hood. Nevertheless, he grew very much attached to his grandparents, and throughout his ‘life has always held their memory clear. They were typical representatives of the real old Calvinist model, but possessed, withal, of a vast amount of true tenderness of heart, which, however carefully restrained, was yet ever visible to the wistful eye of the fatherless child they had taken into their home. When he grew old enough, young Sutherland was placed under the care of the famous Dr. Melvin, who was reputed to be one of the finest classical scholars of the century, and who was then the headmaster of the Aberdeen Grammar School. Here he remained until he was fourteen, when it was decided to send him to the University, in order that he might be prepared for the Church. It was the earnest desire of honest old grandfather Webster that his grandson should become a minister, but the lad himself shewed no inclination towards that career. His term at the University was consequently cut short when he was only fifteen years of age, and he was placed in a merchant’s office in Aberdeen, with a view to being sent out to an uncle in America, who had entered on an apparently prosperous career as a banker and land agent. The American uncle’s prosperity met with a severe check, however, and as the check seemed likely to exercise its baleful influence for some time, young Sutherland was forced to look about for an opening elsewhere. THE CLUE TO THE FUTURE. One day he heard his mother and aunt talking about a certain Mr. James Allan, an old acquaintance of theirs, who appeared from their conversation to have flourished exceedingly in the world, as he had become the managing director of a great steamship company in London, and was in receipt of a large income in that capacity. Young Sutherland thought that something of the same kind would suit him very well, and he accordingly asked his people to write to this Mr. Allan, and try to secure for him an opening in the company. He did not know the name of the company, and had the vaguest idea of what the duties of the post he was seeking would be; but the application was successful, and before he had attained his eighteenth birthday, young Sutherland was appointed as a junior clerk in the offices of the Peninsular and Oriental Steam Navigation Company. 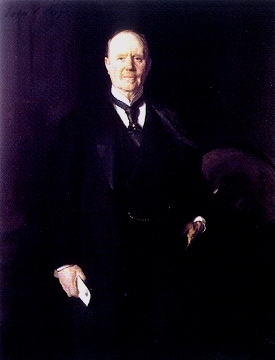 It is interesting to note that twenty years later Sir Thomas Sutherland was the means of keeping his early friend Allan and the other members of the Board of Directors in their seats at a time when, owing to the critical position of the company’s affairs, they were threatened with dismissal by the fierce attacks of angry and disappointed shareholders. Thus began a connection which has proved beneficial not only to the young Scotsman, but really much more so to the company, for Sir T. Sutherland’s great claim to recognition lies in the fact that he not only had a large share in the development of the company, but that his efforts proved the salvation of the concern at a very critical period of its existence. It is probable that but for the advent of young Thomas Sutherland, with his strong common-sense, sound business instincts and courage, there would have been no "P. & O." to-day—or, at any rate, that the undertaking would have occupied a much less prominent position in the shipping world. THE FIRST RUNG OF THE LADDER. Young Sutherland "took to" shipping office work as to the manor born, and in less than a year he obtained a thorough initiation into the system of business as then conducted at the old London coaching house which the "P. & O." had made their headquarters in Leadenhall Street. He had a friend in the Managing Director, of course, but Mr. Allan was not the kind of man to shew favours to incompetent employees, however great, a personal interest he took in their welfare, and Sutherland had to rely on his merits alone. He was eager to see the world, and to win his spurs, and after he had been in the office for a couple of years a vacancy arose in the company’s staff in Bombay, and Sutherland was sent out to fill it. He was almost immediately sent on to Hong Kong, and here the real work of his life began. From being a junior assistant, he rose in a few years to be the superintendent over the affairs of the company both in China and Japan.. In this capacity he had almost a free hand to organise the company’s business in the Far East as he chose, and he took full advantage of the opportunity. He not only carried on the ordinary business of the company with exceptional success, but largely extended its scope. He opened out coasting services to such ports as Amoy, Swatow and Foochow, in connection with Hong Kong, Canton and Shanghai, and commenced the first regular steam service with Nagasaki and Yokohama, which were at that date the only ports in Japan that were open to British enterprise. Mr. Sutherland’s vigorous and successful management of the company’s affairs in Hong Kong—which was then, as now, one of the most important shipping centres in the world—soon made him a power in the community in which he spent these twelve years of his life. In association with a Mr. Douglas Lapraik, he founded the well-known Hong Kong and Whampoa Dock Company, which is at the present day one of the largest concerns of the kind in the world. They built docks under arrangements with the Admiralty to admit the largest ships in the Navy, thus creating in Hong Kong an effective naval base. THE BANK OF THE EAST. The most important work carried through by Mr. Sutherland during these early years in Hong Kong, however, judged by the wide-spreading results which followed in its train, was, in all probability, the foundation of the Hong Kong and Shanghai Banking Corporation, which has been for the last thirty years at the head of all the financial establishments of the East. It was a somewhat curious set of circumstances that led Mr. Sutherland to determine on the organising of this undertaking. The European business community in China was entirely dependent, at that time, on English and Indian banks, and he had often wondered that the public spirit of the merchants there had never induced them to start a bank of their own. He had been reflecting on the subject for some time, when an incident occurred which brought his thoughts to a practical issue. This was nothing other than a somewhat impudent attempt on the part of certain speculators in Bombay to promote a Bank of China, for the purpose of gambling in the shares, which they had mostly allotted among themselves. Mr. Sutherland became acquainted with the fact in a somewhat peculiar manner, for it was in consequence of a request that he should hold himself in readiness to become connected with the new institution. He set to work, however, to write the prospectus of a bank that should be the property and concern of the China merchants themselves. The idea was favourably received by the leading firms in Hong Kong and Shanghai, and in a very short time the bank was started. A charter was obtained without much difficulty, and Mr. Sutherland was nominated as the first vice-president of the concern. He was the principal working director during the first two or three years of the bank’s existence, and much. of its success is undoubtedly due to the sure foundation on which it was started, as Sutherland’s colleagues on the Board of Directors handsomely testified when he ceased to be one of their number. Towards the end of 1864, Sutherland was appointed by Sir Hercules Robinson (the then Governor) as one of the three unofficial members of the local Legislative Council. This was a flattering compliment, seeing that Mr. Sutherland was only in his thirtieth year at the time, and an undeniable tribute to his ability and standing in the community. The China merchants at that time were men of immense wealth, and were regarded almost as princes, and Sir Hercules had a very wide field from which to choose. The young representative of the "P. & O." must have had something noteworthy about him to cause him to be singled out in this way. The appointment was all the more flattering as it was accompanied by a letter from the Governor in which his Excellency stated that "the appointment would give more satisfaction to the commercial community than any other which was open to him to make." The authorities in Leadenhall Street could not fail to realise the abilities of their young representative in China, and they came to the conclusion that an officer of his proved capacity could do better work, for them elsewhere. Accordingly, two years later, in 1866, he was recalled home. After twelve months spent at the headquarters of the company, Mr. Sutherland was sent on a mission of reorganisation to the various stations of the company throughout the East. His twelve years’ experience in China had given him an invaluable insight into both the weakness and the strength of’ the company’s operations in the Orient and at home, and the success he had achieved in the work he had been entrusted with had won for him the entire confidence of his superiors. They gave evidence of their confidence in him by endowing him with the full powers of the Board to effect any reforms that might be in his opinion necessary. In carrying out this important mission, Mr. Sutherland obtained such a thorough grasp of the company’s business in every detail that when the undertaking was subsequently placed in serious difficulties through the great changes brought about by the opening of the Suez Canal, he became the one strong man on the staff who had the necessary knowledge to come forward and rescue the concern from probable disaster. MANAGING DIRECTOR OF THE "P. & O." In 1872, Mr. Sutherland’s great chance came. He was appointed managing director of the company, and never was an important post more happily or more usefully filled. The time of his advance to the position of managing director was the moment of the company’s most serious adversity. The old foundations of the concern and the monopoly which they had practically enjoyed prior to the opening of the Suez Canal had been swept away. The difference which the construction of the Canal made to the revenue of the company from its carrying trade may be gathered when it is mentioned that prior to the opening of the new route the tariff for the carriage of miscellaneous goods of all kinds from this country to China and Australia was at the rate of from £20 to £25 a ton; by 1875 the rates for general cargo had dropped to forty shillings per ton! Consequent on these new conditions, the whole fleet had become obsolete, and had to be replaced with the greatest possible speed, and the entire service had to be reorganised in order to cope with the new situation which had been created. This was a task which occupied several years, and was all the more difficult in that it had to be accomplished in the face of a declining revenue and diminished credit. Mr. Sutherland gave his attention exclusively to this work, and eventually he succeeded in replacing the company on a firm footing. He gained the confidence of his older colleagues not only by his administrative capacity, but by the skill with which he defended the. policy of the Board at many of the company’s meetings when repeated attempts were made to remove the directors, and even to wreck the company. So well did Mr. Sutherland serve the company that, in 1881, his colleagues elected him as their chairman, and he has held the position ever since. A year later Mr. Sutherland went into another important undertaking—the struggle between the shipping interest of Great Britain and the Suez Canal Company. At that time the grievances of shipowners against the Canal were very real and very serious indeed. The traffic had grown to such an extent that delays in passing ships through were continuous and often scandalous. Accidents were frequent, and the cost of these mishaps were piled up against the shipowners in extravagant figures. No complaint was listened to by the directorate of the Canal and the attitude of the staff in Egypt was one of the scantiest courtesy. The Canal Company was, therefore, the object of peculiar dislike, for while the service was bad, the tariff and other expenses were most onerous. As the Chairman of the P. & O. Company—then, as now, the largest customers of the Canal—Mr. Sutherland set to work to organise among the leading shipowners an opposition to this state of affairs. The result of their campaign, in which they had the powerful assistance of the Times, soon began to be felt in France, where the shares of the Canal Company, which had reached a very high figure, fell rapidly in price. The English occupation of Egypt had, of course, much to do with the uncertainty of the French shareholder as to the value of his property, but the shipowners here were spending money freely for the purpose of disseminating their views as to the necessity for a second Canal which should be under British control, and they lost no opportunity of publishing the fact far and wide that the legal opinions they had obtained did not support the pretensions of the Canal Company to a monopoly of the route. The first result of this activity caused an outbreak of astonishment on the part of the shipping interest. They had been freely in communication with the Government throughout, and what then was their surprise to learn that the Government, behind their backs, had entered into an agreement with M. de Lesseps which "gave away" the shipping interest completely, postponed almost indefinitely the reduction of the charges, and undertook to provide eight millions of British money, on easy terms, for the use of the Canal Company! It is scarcely necessary to say that this very strange agreement had to be abandoned by Mr. Gladstone almost as soon as its extraordinary terms became publicly known. The Government which had blundered so badly could think of no better way of meeting the grievances of the shipowners than to invite M. de Lesseps, the constructor of the Canal, to a Lord Mayor’s banquet, with a view to his settling the difficulty himself. After the banquet, M. de Lesseps and his son made a sort of triumphal progress through the provinces. As they carefully ignored the Shipowners’ Committee in London, however, no result followed, except that the shares in the Canal continued to droop, and matters stood at a deadlock. When Charles de Lesseps returned to London, however, he came to the conclusion that he must try another policy, and he accordingly sent word, through Sir Rivers Wilson, that he would like to have an interview with Mr. Sutherland. The meeting took place immediately, and lasted about five hours. A basis of agreement was there and then arrived at for an alliance between the Canal Company and the shipping interest, and meetings were subsequently arranged to take place between representatives of the various lines and M. de Lesseps. These took place soon after at the offices of the "P. & O.," and lasted many days, for the details of the proposed arrangement were not very easily settled. At length an agreement was signed which involved a complete revolution in the relations between the Canal Company and their customers, and the change for the better that took place was extraordinary—so much so that scarcely a complaint has since been made on the part of the British shipowners. At the same time, in spite of the reduction in the rates granted to the shipping interest, and the other concessions, the profits of the Canal Company have grown in such a manner that the shares, which had fallen below £70 at the time the agreement was made, now stand at something like £150. The effect on the shares owned by the British Government must have been to increase their capital value by nearly sixteen millions sterling. Mr. Sutherland was, of course, asked to join the Board of the Canal as one of the seven British commercial representatives, and was nominated by his colleagues as the chairman of the London Consultative Committee, which advises on all matters common to the interests of the Canal and shipping. These offices he still holds. THE "P. & O." TO-DAY. How closely Sir Thomas Sutherland—he was knighted in 1891, and received the Grand Cross in 1897—has been concerned in the development of the P. & O. Company may be gathered from the fact that when he first became responsible for the direction of affairs the fleet owned by the Company consisted of an aggregate of 100,000 tons; its tonnage to-day is little short of 350,000, and it constitutes the greatest as well as the most costly fleet of vessels under the British flag. The share capital has even been reduced, and now stands only at £2,320,000, and there has also been an issue of debentures to the amount of £800.000. The company, which insures its own ships, possesses a reserve fund of a solid million sterling. Sir Thomas is a man of many activities both inside the walls of the P. & O. Company’s office, and elsewhere. For nearly twenty years he sat in the House of Commons as Member for Greenock. He married, in 1880, Miss Macnaught, the charming daughter and heiress of a wealthy clergyman, and rejoices in two sons and a daughter. The elder boy is at Sandhurst, and the younger is still at Eton. Sir Thomas has a delightfully romantic country place near Liss, in Sussex, close by the Hampshire border, where he now spends most of his leisure. He has deserved well of his country, for few men have done more, in a characteristically thorough and unostentatious manner, to develop British trading interests and to organise the bloodless victories of commerce. The death of Sir Thomas Sutherland at the age of 87, removes a noteable figure who in his day had done great work. For 40 years, as managing director and then as chairman of the P. and O. Company, he took a more active part than probably any other man of his time in the expansion of that network of communication with both the Far East and Australia which has exercised so important an influence on our commerce and our Empire. He died at the age of 87. Sir Thomas Sutherland sat for Greenock first as a liberal and then as a Liberal Unionist from 1881 to 1909. He was a member of the Load Line Commission which sat in 1882, and a member of the Royal Commission on the Financial Relations between Great Britain and Ireland. In addition, he was a director of the London City and Midland Bank and of the Bank of Australasia, and chairman of the Marine and General Assurance Society. He was, too, a Knight of the Legion of Honour and of the Order of St. John, and one his Majesty's Lieutenants for the City of London. He married, in 1880, Alice, daughter of the Rev. John Macnaught, vicar of St. Chrysostom's, Liverpool; she died in 1920, as did also his two sons, one killed in the South African campaign and the other during the Great War. But for increasing deafness Sir Thomas retained all his facilities, and was a regular visitor to Paris, where he had many friends. In the dark days which overtook the de Lesseps family owing to the Panoma collapse, he never wavered in his friendship, and it was mainly owing to his good offices that Count Charles de Lessep resumed his position on the board of the Suez Canal Company. Notwithstanding the very extensive foreign trade with China and Japan [the Hongkong and Shanghae Banking Company (Limited)] is the first Bank locally started or in which the majority of our Merchants are directly interested ... the chief inducement which the promoters had in view was to supply an absolute want arising out of inability of the Branch Banks established here to meet the varied requirements of local trade. This trade implying the business between Hong Kong and the open ports in China and Japan is now of the most extensive character and requires a more special mode of dealing than any Bank Agency can possibly supply. In this respect the promoters of the Hongkong and Shanghai Bank believe that from the experience of its Directors and the sources of information at their disposal arising from the fact of the proprietors being connected with every branch of trade in this country, they will be enabled most materially to aid the legitimate working of business. With this clear statement of intent, the Chairman of the Hongkong Bank’s Provisional Committee applied to the Governor of Hong Kong in December 1864 for a charter of incorporation. This was to be the fulfilment of plans many times considered and many times abandoned. The cause of the new resolve was on board a P&O mail steamer which, on July 22, 1864, had sailed into Hong Kong and changed banking history. The Hong Kong Superintendent of the Peninsular and Oriental Steam Navigation Company, Thomas Sutherland, had boarded the mail steamer Singapore in from Bombay. The formalities concluded, Sutherland, no doubt with a hospitable word, was about to disembark when the Captain motioned him to the cabin. There was news from Bombay. The news concerned a ‘local’ bank even then in the process of promotion in Bombay. What made the news exceptional was that this bank, the Bank of China, was to have a head office in Hong Kong and finance regional trade between Hong Kong and the treaty ports of China and Japan. The merchants of Hong Kong would understand the need — indeed, none better. This was ‘an idea which had frequently been talked up here for discussion and as often dropped for want of someone to push it’. And now, in the privacy of the Captain’s cabin, Sutherland was to be told the news first — a Bank of China floated in Bombay to do just those things which the Hong Kong merchants had so often, talked of. Here was the opportunity for a speculation, to be among the first subscribing to the shares of the proposed bank which would, even before allotment, fetch more than 70% premium. Sutherland knew enough of Bombay to recognize this possibility; he knew that to be allotted shares was to be assured immediate gain — the stags would benefit; they could sell almost immediately to considerable advantage. There was an alternative, although not one which the ordinary shipping agent might consider. But then, as his subsequent career proved, Sutherland was not an ordinary agent. He would become, at the age of fifty, the Chairman of the P&O, but first he would found the Hongkong and Shanghai Banking Corporation. Sutherland’s immediate reaction to the news from Bombay was critical of his Hong Kong friends — ‘I thought they would deserve whatever fate might befall them.’ Fortunately, he reconsidered. In addition to its regular cargo, a coastal steamer, like a floating doctor’s waiting room, apparently carried collections of ageing magazines. In 1864 while on a voyage by the SS Manila between Hong Kong, Swatow, Amoy, and Foochow, Sutherland had come across an article in a twenty-year-old edition of Blackwood’s Magazine on the advantages of Scottish banking. On the basis of this he concluded that founding a bank on Scottish principles would not be difficult. Recalling this article and recognizing that the founding of a local bank had now become a matter of urgency, he decided to fill the want complained of; he would be the one to ‘push’ the establishment of a local bank. Given the competitive nature of the Hong Kong mercantile community, perhaps only a man standing outside it, but serving it, could have overcome the rivalries and suspicions of the independently minded merchants and pushed such a project through. Against the background of the traditional rivalry between Jardine, Matheson and Co. and Dent and Co., between Russell and Co. and Augustine Heard and Co., there were the new rivalries stemming from the promotion of rival docks, rival insurance companies, rival shipping firms. Now more than ever they needed banking facilities, but under whose control, and for what purposes? Sutherland was not a wholly innocent bystander; he was sufficiently involved to lend credibility, independent enough to command respect. To be successful, a local bank would have to meet the diverse needs of the community and gain constituents from rival firms because it promised to serve them all. It would need to become the main depository of local funds; firms would have to open their own treasuries and deposit their silver bars and sycee with the new bank. The local bank would then extend credit. . . but to whom, for what purposes, and under whose control? But if the merchants watched each other closely, they were also proud of Hong Kong. When they heard of Bombay’s Bank of China the ‘news caused considerable talk and excitement. . . as it was thought to be cheeky’. If this were a merchant’s view, the local press, commenting on the recent past, was more outspoken. Thus it came to pass that a few enterprising Parsees and Scotchmen in Bombay invented and achieved so many banks in China. They had little money but they had eyes in their heads and sense too. They saw a clear field before them with a lot of small donkeys browsing on it, and they turned it to pretty good account. The writer was perhaps thinking of the Agra and United Service Bank, the Bank of Hindustan, China and Japan, the Commercial Bank Corporation of India and the East, the Asiatic Banking Corporation, and the more firmly established Oriental Bank Corporation and Chartered Mercantile Bank of India, London and China. These, however, were exchange banks extending their Indian based business to China and thus, it could be argued, offering credit on competitive terms with little risk to the independence of the local merchant. Now, however, came the Bank of China to be a ‘local’ bank, to hold the government accounts, finance local industry, to be to Hong Kong and Shanghai what the Presidency banks — the Bank of Bengal, for example — were to their respective Indian regions. The Hong Kong community was once again, it seemed, unable to take the initiative. Soon, it was promised, a Neale Porter, emissary of the Bank of China, would visit Hong Kong to recruit directors, line up business, and accept subscriptions for the few shares which the Bombay promoters had graciously reserved for the China-coast. The editorial cited had been inspired by the prospectus of the Bank of China published in the same paper on July 28, 1864. But Sutherland had ‘pushed’ and the Prospectus of the Hongkong and Shanghae Banking Company Limited together with a list of the promoters was published in the China Mail that same day. The shipping lists indicate that the last Bombay mail steamer must have arrived on July 22, giving a maximum of five days for the rallying of the leading merchant houses and undertaking the preliminary work necessary for the founding of a $5 million bank. But that is not, in fact, quite what happened. Sutherland worked fast, but he was also realistic. A bank is being started here to compete with outsiders, Hong Kong and Shanghae Banking Corporation or some such name. I am urged to be one of the provisional committee with Chomley, Maclean, Lapraik, Sutherland and others.. . nothing yet is settled and I don’t intend to take a very prominent part in promoting it. The appearance of the Bombay [Bank of China] prospectus stirred up those interested in the Hong Kong scheme and in consequence the Hong Kong scheme has been put forward hastily in a prospectus concocted by Pollard and Sutherland in the last 48 hours. I have never favoured the scheme save in a very general way and when applied to for my name on the Provisional Committee! did not refuse it nor did I agree to it. !n fact I was, I confess, rather taken by surprise this morning to see it all in print, my name on the list. . . The first time I saw the prospectus it was in the paper. I had not given consent for the use of my name but hesitated and did not decline, supposing it would be open for discussion after the mail. [E.H.] Pollard however rushed the matter thus in order to have it go to India and check mate a plan originated in Bombay for a Bank of China to come on here for just that purpose and object which the Hong Kong bank intends to fill. The tone of these letters may be partly explained by the fact that the Heards already were involved in several joint-stock companies and consequently reflected A.F. Heard’s concern that his distant partners might not approve of his involvement with yet another promotion, with the ‘locking up’ of funds, or with prejudicing the firm’s relations with their already established banking connections, for example, the Comptoir d’Escompte de Paris and the Asiatic. But the confession that ’I did not refuse. . . nor did I agree’, correctly reflects the mercantile attitude which Sutherland had to overcome. He achieved his goal by presenting publicly an apparent fait accompli — ‘apparent’ because the published members of the Provisional Committee did not, in fact, meet and declare themselves so until August 6. Heard would seem to be indignant as to the way the matter was rushed and cautious as to his future role. His real attitude is pride that the ‘house’ had been approached as the representative American firm in China and resignation to the inevitable — with just the hint that he might yet make something good of it all. That none withdrew is a comment on Sutherland’s correct reading of the situation. Public sentiment was at last behind the scheme and those who for so long had discussed it and set it aside had now been committed to a responsibility they found difficult to evade, and once committed they did not, be it said in fairness, attempt to do so. There is a tradition that the Hongkong Bank was founded at a dinner party. There may well have been a dinner at which the participants were unaware they were founding a bank. Sutherland took the sense of the conversation and published the Prospectus without further consultation. Or, if this is being too charitable to the story, something of the kind must have occurred — the known facts are not in substance much different from the legend. !n his own account Sutherland states that he wrote up a draft prospectus overnight, took it to his legal adviser, E.H. Pollard, and together they solicited support. They moved so rapidly, indeed, that the Hongkong Bank Prospectus, which had to be drawn up ab initio, was published on the same day as the Bank of China prospectus, which had arrived in Hong Kong fully prepared. Heard writes of a 48-hour period, and certainly the maximum, given the arrival of the P&O steamer Singapore on the 22nd and Heard’s knowledge of the project on the 27th, would seem to be but four days. There is, however, a limit to credibility. How could the P&O agent, however brilliant, design a successful banking project in so short a time? What in fact did he achieve; what was the ‘Prospectus’? Whatever other argument the promoters might put forward — the ending of the compradoric system, the reform of the currency, the encouragement of local business as opposed to exchange operations — the key to the Bank’s success lay in its local support. While this was to be true in the long history of the Bank, its immediate relevance was as a counter to any claim the Bombay-promoted Bank of China might have to a legitimate role on the China coast. The language of the Prospectus suggests that either Sutherland or Pollard had access to comparable documents and, not surprisingly, to that of the Bank of China itself. Both prospectuses make comparison between the Presidency banks and the proposed China-coast bank; the Hongkong Bank adds a legitimate comparison with the local Australian banks. The Hongkong Bank Prospectus does contain specific reference to conditions in Hong Kong, confirming that this was not merely a flash reaction but was the promotion of an enterprise ‘in contemplation for a very long time’. At some point in the early negotiations a necessary but potentially dangerous decision was made. Sutherland’s advantage was his standing outside the mercantile community, but the prospective bank needed a base, a sponsor, to move it beyond the realm of a vague promotion to the immediate semblance of organization. Thus it was that the Prospectus was signed, not by Thomas Sutherland or indeed by any individual, but by the leading British merchant house of Messrs Dent and Co. In a community where the managing agent system had already developed, there was a danger that the bank might become the creature of— or at least be dominated by — a powerful company and, by this association, find itself opposed by the major hongs while at the same time losing the support of smaller companies and individual entrepreneurs. The opposition from the rival hong of Jardine, Matheson and Co. materialized immediately, primarily in the form of legislative opposition to the proposed companies ordinance. As it happened, the Provisional Committee by chance or instinct kept their new bank relatively independent, while the failure of Dent and Co. in 1867 removed the danger at a critical point. If the bank’s base were to be British in a British colony, the choice was Dent or Jardine Matheson, and, by approaching Dent’s first, the promoters put Jardine’s in opposition. But there may have been little choice. Jardine’s banking aspirations were well-known, and it may have been that Dent’s, already detecting their own weakness, felt they had more to gain than lose from sponsoring a banking institution. In accepting this traditional assumption, based as it is on the well-known rivalry of the two British hongs, there is a danger in overlooking the competition between Jardine Matheson and other firms interested in the Indian trade, especially Messrs D. Sassoon, Sons and Co., but including also P. and A. Camajee and Co. and P.F. Cama and Co., all of whom signed the original Prospectus. The role of the Sassoons will be considered further below. With the Prospectus and the organizational sponsorship determined, Sutherland and Pollard solicited support. Since they were willing to accept an equivocal response as sufficient authority to include the name in the published list of the Provisional Committee, this should not have been difficult. Thus the timing is sufficiently explained, and the focus must now be on the organizational activities of a committee formed under such exceptional circumstances. The Provisional Committee gave first priority to getting started. This, as it turned out, was to be another key to success, a principle which might be described as taking responsible action and formalizing it afterwards. The Bank opened for business on March 3, 1865, but the formalities of its incorporation were not concluded until July 1867. The Bank established agencies and branches, on the basis of cautious business assessment, as required and in good faith; certain of these actions did not receive full legal recognition, however, until the revision of the Bank’s ordinance in 1889. The problem was Treasury misinterpretation of the doctrine of extraterritoriality as it applied to the acts of a colonial legislature. This the promoters and directors of the Bank could not be expected to foresee. And, in fairness to Colonial Office and Treasury officials, virtually from the time the Bank’s initial request for a charter reached the Treasury in London, these civil servants accepted that they were dealing not with a speculative promotion but with an operating bank. This official attitude — the Bank has done what it ought not to have done, but how can the problem be corrected without damaging either the Bank or its constituents — would prove decisive throughout. The Hongkong Bank was to be a local bank. To ensure this three policies were pursued: (i) there had to be broad local representation on the Board of Directors, and, before that, on the Provisional Committee, (ii) there had to be local support through a proper allocation of shares, and (iii) the Board of Directors had to be located where the Bank operated. By ‘local’ the Bank’s supporters did not mean Hong Kong only, but Treaty-Port China and Japan. The stress was on China, and the Shanghai branch was to open virtually simultaneously with that in Hong Kong; there was to be no ‘chief’ manager, and the Shanghai Manager would operate under a local committee. As the Bank evolved, it is true, direction devolved to Hong Kong whose Manager became ‘Chief Manager’ in 1868 and the committee at Shanghai disappeared; nevertheless, the Shanghai Manager retained access to the Board of Directors and he and the Hong Kong Manager were in a sense partners, the former would as the years passed be in control of the Bank’s resources in China, the latter would control the world-wide distribution of the Bank’s staff and funds. The Hong Kong Manager would become the ultimate arbiter under the directors; he would be the ‘chief’, yet the Bank would remain both a Hong Kong and a Shanghai institution. Development in Japan would be significant, but the Bank was primarily China-oriented. To be successful the Bank’s promoters had to be representative of or acceptable to potential constituents. Who then were the members of the Provisional Committee? There was the founder, (Sir) Thomas Sutherland (1834—1922), who was to become MP for Greenock (1884—1890), GCMG, chairman of the P&O in 1884, then chairman, London Board of the Suez Canal Company and a director of the London, City and Midland Bank. In 1864 he was Superintendent of the P&O —and one of his major customers would be D. Sassoon and Sons — and in 1865-1866 he was a member of the Hong Kong Legislative Council. Without him there is no reason to suppose the Bank would have been started. Already active in the economic life of Hong Kong, in 1863 Sutherland had become the first chairman of the Hongkong and Whampoa Dock Company and in this venture was closely associated with Jardine’s and Douglas Lapraik. Yet he would, in establishing the Provisional Committee, prove equally able to win the confidence of Francis Chomley of Dent’s and A.F. Heard of Augustine Heard and Co. The credit for leading the Committee through the initial complexities must go to the man unanimously elected Chairman, the Hon. 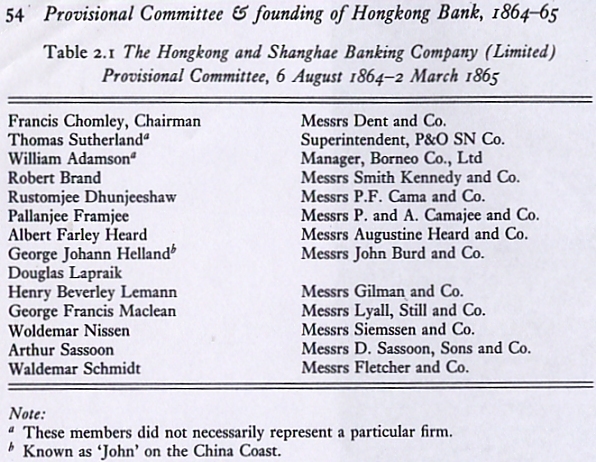 Francis Chomley, senior partner in China of Dent and Co. Dent’s were at the time agents in China for the Scinde, Punjaub and Delhi Bank, but this would appear to have had no impact on their role in the founding of the Hongkong Bank. Dent’s prominent role did not lead to the eclipse of Sutherland; there was no crude takeover from an inexperienced initiator, for indeed Sutherland, who remained influential in matters affecting the Bank, was to be elected Deputy Chairman of the Bank until his departure for Shanghai in April 1866, defacto acting Chairman of the Bank during Chomley’s absence from May to December 1865, and member of the Board until his own departure from China in November 1867. The success of the Hongkong Bank, however, undoubtedly rested from the first on the broad international base of its directorate. This was a British bank in a British colony on whose founding committee eight of the fourteen members were not from Britain, and which, for some four months in 1875, was without a single British director. In 1864 the goal was to develop the China trade and the Treaty Ports; there was room for all, not the least for German traders from the Hanseatic City of Hamburg or for American merchants from Ipswich, Massachusetts, with long-standing China connections. Thus on this first Provisional Committee Siemssen and Co. and Augustine Heard and Co. were represented, and they would soon be joined by Wm Pustau and Co. and other German companies and by Russell and Co., the senior American firm in China. In addition, Helland was Norwegian, and Schmidt was apparently German. This tradition lasted until 1914. The American companies which had participated in the Bank’s early fortunes had by then left the China coast. The Germans, however, remained until the Great War not only forced their removal but challenged the basis for the Bank’s early success — its open accommodation to merchants of all nations. For a time the Bank yielded, but the logic of commerce on the China coast forced the Bank back to its historical role even during the constraining times of the inter-war period. The German connection would in time of war be misunderstood — a problem inconceivable as Sutherland and Pollard made their rounds in 1864. There were five British trading partnerships represented on the Provisional Committee. 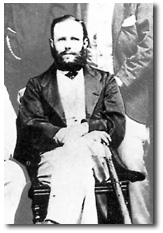 The manager of the Borneo Company, Wm Adamson, who had a long career in Singapore and Siam (he introduced Anna to the King of Siam), and Douglas Lapraik, a vigorous and independent entrepreneur, completed the British contingent. Lapraik, who was an early settler in the Colony, had begun his career as a watchmaker and the metamorphosis by which he became a shipbuilder, the owner of a shipping service on the China coast, the promoter of dock companies and the owner of the baronial Douglas Castle at Pokfulam on Hong Kong Island is told in Austin Coates’ study of the Hongkong and Whampoa Dock Company. Here was a man who, like A.F. Heard, represented the new spirit of development in Hong Kong. They would provide stimulus to the Bank, but their requirements would need to be controlled.